This story was updated at 6:28 p.m. ET. CAPE CANAVERAL, Fla. – NASA called off its attempt to launch the final voyage of the space shuttle Endeavour today (April 29) because of a malfunction in one of the spacecraft's critical power units. "It's unfortunate for the [Endeavour] team and Mark Kelly and his crew, but today the orbiter's not ready to fly, and as we always say in this business, we will not fly before we're ready," launch director Mike Leinbach said. Two heaters on one of Endeavour's auxiliary power units, which power hydraulics systems on the shuttle during its return to Earth, failed this morning, rendering the unit useless. "The troubleshooting proved that it was a hard failure," Leinbach said. "We were not able to get it to come to life no matter what we did." Mission managers decided to delay at least 72 hours to look into the source of the problem. NASA has through May 4 to continue trying to fly Endeavour. After that, the shuttle must stand down to allow an unmanned Atlas 5 rocket to launch from the nearby Cape Canaveral Air Force Station on May 6. NASA can pick back up again trying to launch Endeavour May 9 or May 10. "We look like we've got a good shot to keep trying here," said Mike Moses, chair of the shuttle's mission management team. NASA called off today's launch at 12:19 p.m. EDT, after Endeavour was fully fueled and the astronauts were suited up in their bright orange launch and entry suits. The launch delay likely disappointed the throngs of spectators that flooded the launch viewing sites around the Kennedy Space Center with hopes of seeing one of NASA's final space shuttle launches before the 30-year-old shuttle fleet is retired for good later this year. The space agency expected up to 750,000 spectators for Endeavour's launch. "Obviously we would have very much loved to have seen Endeavour lifting off this afternoon, but that wasn’t to be the case," Bob Cabana, director of Kennedy Space Center, said in a press conference Friday afternoon. "Safety always comes first." Among the disappointed hopeful viewers of the launch are President Barack Obama and his family, who were planning to watch Friday's shuttle liftoff. There's no word yet on whether Obama will still attend the next launch attempt. Many thousands of others will also have to postpone their shuttle-viewing plans. Florida's Space Coast was expecting an influx of tourist revenue from the roughly three-quarters of a million visitors. Endeavour's veteran crew will be led by Mark Kelly, husband of wounded Congresswoman Gabrielle Giffords, D-Ariz. Giffords, who is recovering from a bullet wound she received during a January mass shooting outside a Tucson grocery store. Giffords is here at Kennedy Space Center to watch her husband launch into space. NASA is retiring its space shuttle program after just two more missions to make way for a future exploration plan aimed at sending astronauts to visit an asteroid by 2025. After Endeavour's final flight, NASA will launch the Atlantis orbiter on the last-ever shuttle mission — a flight that is currently slated to lift off on June 28. All three of NASA's spaceworthy shuttles, as well as the prototype Enterprise which never flew in space, will be retired to museums for public display. 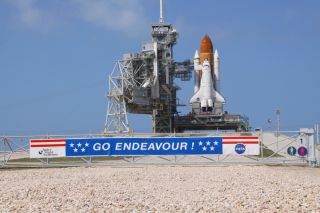 Endeavour will retire to the California Science Center in Los Angeles, with the other three vehicles going to museums along the U.S. East Coast.